Female Transformation Of The Week - Jodi S.! Last year, Jodi made the mistake of going overboard while trying to add some mass to her frame. Now she's learned from her mistakes and is more determined than ever to build the body of her dreams. 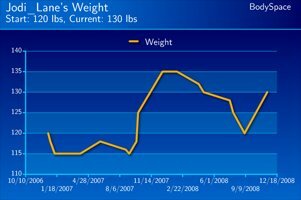 Learn how she dropped 25 pounds and 13% body fat! On September of 2007, I competed in the OCB Natural Indiana Competition and was fairly thin, but not as lean as I would have liked to be and didn't have nearly enough muscle. I made the mistake of going overboard in the off-season of eating to gain mass. I actually gained 30 pounds in my off-season. 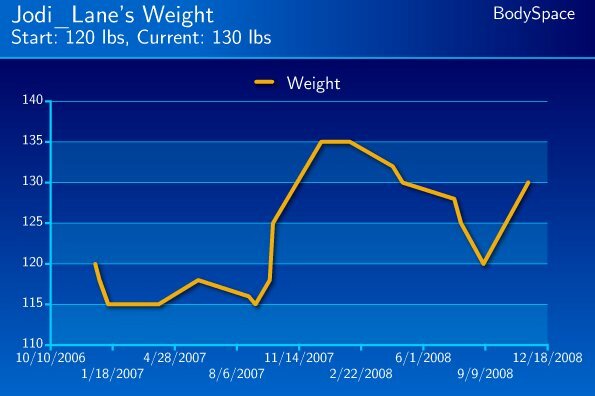 So after learning from my mistake, I decided to continue bulking through the winter and prepare for the OCB Natural Indiana Competition in 2008. I Made The Mistake Of Bulking In The Off-Season. I followed a basic competition prep diet and training routine. Rebecca Slatt, my contest prep coach, helped me with carb cycling, my training schedule to enhance the areas on my body that needed size (my upper body), and my cardio. My diet is talored specifically to my blood-type, which is something that is somewhat new out of the nutrition field but I have seen great results with it. To find out more about nutrition and your blood-type, I suggest reading Dr. Peter J.D. Adamo's book "Eat Right For Your Type." My Diet Is Tailored Specifically To My Blood Type. Because I had a contest prep coach, I don't want to reveal all of her secrets. This diet was created specifically for me, but sometimes it takes a little bit of trial and error to find what works best for you. Carb cycling seems to be most ideal for myself. , but the results are amazing. were only eaten in the morning and post-workout. were consumed in my first four meals, but removed as the day progressed. I worked a different muscle group each day of the week. I tried to stay on a 10 rep max because I knew that was the best way for me to build muscle. I avoid any heavy training with legs because they grow easily. My workout was focused mostly on building my upper body. Click Here For A Printable Log Of Monday: Shoulders (Heavy). Click Here For A Printable Log Of Tuesday: Back. Click Here For A Printable Log Of Wednesday: Biceps & Triceps. Jodi Working On Building Her Biceps. Click Here For A Printable Log Of Thursday: Shoulders (Light). Click Here For A Printable Log Of Friday: Legs. Take some time to perfect your diet. Make it your main goal because without your diet being correct, you're going to waste a lot of time and energy in the gym without seeing much results. Once you feel comfortable with your diet, start out with simple training to keep you motivated. Don't overtrain! Begin by doing one muscle group per day for four or five days per week. Follow each weight training session with 20 minutes of HIIT. HIIT is intense. It really makes you feel like you accomplished something and is a great way to do cardio. Take Some Time To Perfect Your Diet. Another suggestion for those who are finding it difficult to keep motivated is to make yourself go to the gym. Don't skip any workouts. Even if your training session is only for a short amount of time, still give it 100%. After a while, the lack of motivation will subside. Be sure to take your two days of rest back-to-back. The rest days are important for your body to recover and give you a mental break from the training. Give Yourself A Mental Break. If you are interested in competing, start looking up local shows and give yourself plenty of time to prepare for it. It's amazing to be up on the stage showing off your hard work. Best of luck to everyone with their goals!